The Transantarctic Mountains cross the continent, dividing the ice sheet into two parts. The larger, eastern part of the ice sheet rests on land that is mostly above sea level. It has been there for millions of years. The smaller, western part is on land that is mostly below sea level. Other mountain ranges are the Prince Charles Mountains and smaller groups near the coasts. The Antarctic Peninsula has many mountains. 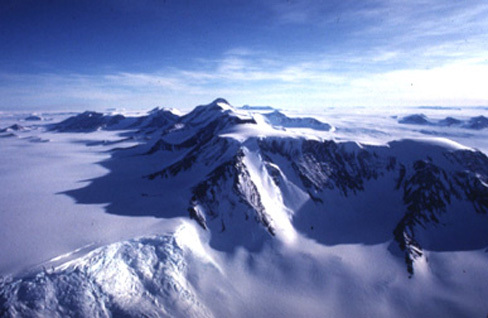 The Ellsworth Mountains are Antarctica's tallest; the Vinson Massif is 4,897 meters above sea level.